Home > Resources > Truepoint Viewpoint > Retirement Planning > How Does Your 401(k) Plan Stack Up? When was the last time you evaluated your company’s retirement plan? For many people, their 401(k) or profit sharing plan is the largest – or at least one of the largest – investment accounts in their portfolios. Many factors can help you evaluate your retirement plan, but among the most important are these: total expenses, investment options, guidance provided, and company match. 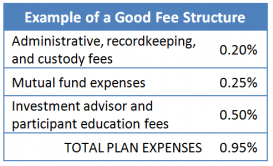 Unfortunately, retirement plan fees often lack transparency. Many plans have mutual funds with high expense ratios that provide “revenue sharing” to the plan’s administrator and advisor. In this type of arrangement, fees are not explicitly charged but rather are embedded in the reduced performance of the underlying funds. This leads many employees to believe their 401(k) plan is “free” when, in reality, they are paying a high cost without realizing it. It is not uncommon to see total expenses between 1.5% and 2.0%, with many actually exceeding 2%. These percentages may seem small and the differences between them even smaller, but even one percentage point can make a tremendous difference in net return. Consider that for a $200,000 account balance that is earning 7%, the difference over 30 years of paying 2% versus 1%, for instance, is a staggering $373,000. If your plan’s total expenses are under 1%, you are fortunate. With the recent fee disclosure regulations for company retirement plans, this information should be readily available from your company’s providers. At first glance, it may seem like the more options a plan offers, the better the plan. But more is not better if the selection doesn’t include the option that is best for you. In assessing the investment options of an employer-sponsored retirement plan, the best plans will provide a low-cost index fund in each asset class. Decades of research show the diversification and cost advantages of index funds lead them to outperform approximately 70% of actively managed mutual funds each year. Many people do not have either the time, expertise, or emotional resolve to properly manage their retirement accounts, so a plan that offers guidance may be helpful. However, even in cases where the employer or plan manager offers some form of advice, many employees still may not have the frame of reference or the assurance in the advisor’s objectivity to feel confident about their choices. One way a robust plan may address this gap is by offering a target- date fund (sometimes called a life-cycle or age-based fund) which automatically adjusts its asset mix to become more conservative as investors approach retirement. Although this “autopilot” approach seems easy, there are still many factors to consider. Looking for low fees is important since target-date funds’ expense ratios can vary a great deal. It is also important to understand that target-date funds do not account for risk tolerance and are not flexible, so ensuring you are comfortable with the risk profile of the particular target-date fund offered is essential. An even better option would be a plan that offers a low-cost professionally managed portfolio. This would provide more flexibility and an opportunity to invest at the risk level you prefer. Lastly, it is important to consider the employer’s contribution, whether in the form of a “company match” or a company profit sharing contribution. Whenever you can receive an automatic return on your money simply by contributing to your retirement, you should certainly take advantage of it. The amount that companies contribute on behalf of their employees can vary widely. Based on the wide variety of company-sponsored retirement plans we have seen among our clients, plans range from offering no match at all to companies contributing 15% (of pay) for their employees. If your company matches 3% or more of your pay – whether structured as dollar for dollar up to 3% or 50% on the first 6% — we would consider it a very strong plan. Company retirement plans are the best way to save large amounts of money in a tax-advantaged account, whether pre-tax or Roth. But not all plans are created equally and the quality of your employer’s plan in these four key areas will impact how you prepare for retirement. As always, we are here to help you with these decisions, including contribution levels, asset allocations, and ensuring a proper balance within the rest of your portfolio. And if the quality of your plan does not measure up, we may be able to work with your business or employer to introduce a lower-cost and more effective solution. Please contact your Truepoint advisor with any questions about your employer’s retirement plan and let us help you reach your retirement goals.